The Toronto Star Editorial Board has made its quadrennial candidate endorsements for Toronto’s newly shrunken wards. The Editorial Board is once again unimpressed with the current incumbents. They bluntly state, “Frank Di Giorgio and Frances Nunziata, should be sent to pasture.”. Four years ago, The Star said of Frances Nunziata, “Painfully ineffective in recent years, she has been one of council’s most complacent Ford followers.”. 2014’s opposition to Frances Nunziata, Jose Garcia and Dory Chalhoub failed to get their campaigns off the ground. While Mr. Chalhoub successfully argued that Ms. Nunziata had done little to help her constituents, his and Mr. Garcia’s rightward leanings put them on a par with her politically. Despite endorsements from the Star (and Weston Web – go figure) Mr. Garcia and Mr. Chalhoub placed a distant second and third respectively. This time there are two strong candidates among those opposing the incumbents and both are left-leaning. The Star’s Board has given the nod to Lekan Olawoye as their 2018 choice for councillor stating, “His work on talent development at MaRS and numerous community organizations make him well placed to constructively address the issues facing youth and marginalized communities.”. The other local candidate, Chiara Padovani has built an impressive campaign and will no doubt take issue with the Star’s pick. The good news for them is that the vote will be somewhat split between the two incumbents. The bad news is that the anti-incumbent vote will also be spread between multiple candidates, thus diluting any movement for change. That’s why all candidates will be working hard to ensure that as many people as possible get out to the polls next Monday. Voter participation in 2014 was 53% in old Ward 11 and 55% in old Ward 12. There is plenty of room to improve as some Toronto wards had a voter turnout of over 70% that year. This compared to an average of 60.4% in Toronto as a whole. A similarly low turnout in Ward 5 this year will probably result in one of the incumbents being sent back to city hall. Let’s start with this: Frances Nunziata is an excellent retail politician. If you call her, she will call you back. If you need something done, she’ll get it done. But Weston has been suffering under her watch. Stores along Weston Road are struggling. Transit is gasping. We seem to be in a constant state of construction and disruption, and our town is getting very little out of work that will benefit everyone but us. Something is wrong. And though this is not entirely Nunziata’s fault (she did not invent the digital camera that killed Kodak), Nunziata’s politics are not helping. Frances—can I call her Frances?—is part of Ford Nation. She believes in subways, cars, and low taxes. She believes in business, the little guy, public-private-partnerships, and small government. And these are good things. Except for Weston. They’re not what Weston needs right now. Weston needs public infrastructure and public goods. These are things that increased taxes buy. A city-subsidized childcare would make this a more desirable neighbourhood for young couples. We used to have one. Join the Humber gap, create safe bike infrastructure to get to the GO, and build a bike path along Wilson to join North York and Toronto. Build a path south to the Junction and Bloor. It’s impossible to get there now by bike. The dilapidated houses on Weston must be expropriated and demolished. A YMCA would be great, but let’s start small. There are no community programs at schools in Weston. Why not? The Elms and Amesbury have them. Weston could too. These require taxes, government, patience, and cooperation. These are not the beliefs of Ford Nation. You might then think that Dory Chalhoub would be my endorsement. Calhoub has guts. He’s running on a shoestring budget against an entrenched opponent. He shows up, he campaigns, and he tries. And he ought, above all, to be commended for that. I salute him wholeheartedly for his noble, and Quixotic, campaign. But I cannot endorse him. While Chalhoub he has put himself forward as the person to fix the riding he, too, appears to be fiscally conservative, and as long as he thinks that we can fix our problems without working together—and that’s just another way of saying “taxes”—then he is mistaken. He has no experience. Chalhoub says that every new candidate starts off without it. True. But other candidates prove themselves in the minor leagues before trying out for the majors: Chalhoub, as far as I know, has not been much involved in the riding, certainly not in Weston or Mount Dennis. Dory—can I call him Dory?—also lacks vision. He did not respond to PositionPrimer or InsideToronto to give details about his platform. (Nunziata did.) Dory did not even disclose which mayoral candidate he would back—surely the shortest cut to a platform he could take. His website is incomplete (the links to his policy pages are broken), he has no social media, and even the photos on his website are clipart: in this beautiful town, he chose a picture from Hamilton to represent neighbourhood beauty. If I didn’t know better, I’d say he’s running on a very simple platform: “Not Nunziata. But close.” The lack of policy could be intentional. Like staring at clouds, we can see what we want to. Our choice, then, is between two unsatisfactory candidates, neither of whom seems to have a long-term vision for Weston. Voting will take place in a few days and the campaigns for Council and Mayor will soon be history. The endless campaigning has produced a few surprises, one of which was the collapse of the Olivia Chow campaign. Before nominations opened, the Mayor’s job was waiting for her and the campaign seemed a formality that would end with an inevitable coronation. At the end of last year, my wife and I saw Ms. Chow lose a crowd of ardent supporters after speaking for only a couple of minutes. As she rambled on, the crowd began to murmur and my wife (who has an annoying habit of being correct) confidently predicted that Ms. Chow’s charisma shortfall would result in an unsuccessful campaign. The collapse of support for Ms. Chow has disappointed many who are leery of John Tory and more particularly, Doug Ford. While Mr Tory is undoubtedly a decent man, his natural inclination leans towards business interests and his ideas on transit and transportation are poorly thought out. It seems likely he will win as the alternative spectre of Doug Ford makes a vote for Olivia too risky for many. The Provincial Liberals have committed themselves to implementing ranked balloting which will finally eliminate the need for strategic voting in the future. For now, John Tory is probably the safest candidate to choose. In Ward 11, WestonWeb was despairing that any candidates would step forward to oppose longtime incumbent Frances Nunziata. Eventually a couple signed up, Jose Garcia and Dory Chalhoub. These two unknowns were seen as incredible long shots against the veteran of several successful campaigns stretching back decades. One candidate has used the long period of campaigning to his advantage; Dory Chaloub, whose confidence has grown as his talking points have resonated with voters. In particular, Mr Chaloub is articulate and has been able to connect the dismal state of the ward directly to the inability of Ms. Nunziata to lift York South-Weston out of its deep and decades-long malaise. In addition, Ms. Nunziata’s increased profile as Council Speaker has exposed her flaws to a wider audience. 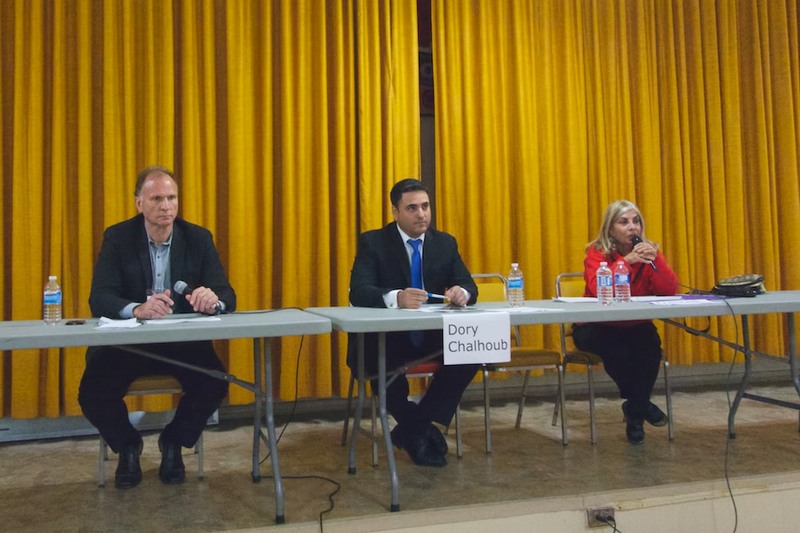 Although there is not much to choose from politically between the two, Mr. Chalhoub understands that York South-Weston needs change and is not stuck in denial about the status quo. He has a background in business and seems intelligent and assertive enough to deserve a chance. Ms. Nunziata sees no problems and therefore seeks no solutions. Her political ambitions lie in city hall; focussing on improving York South-Weston only gets in the way. It’s time for a change. Nunziata: Weston is a good, vibrant community. This is a summary of the October 16 debate at Mount Dennis Legion held in front of about 50 spectators. Only two candidates were present, contender Dory Chalhoub and 26-year incumbent Frances Nunziata. The debate started with a bit of gamesmanship from Nunziata who delayed her opening statement to ask for a moment of silence for the victims of Hurricane Hazel. A more sincere approach might have been to involve the other candidate rather than using the anniversary to score points. With the tone set, Ms. Nunziata proceeded with her opening statement. She feels that the ward deserves a dedicated councillor who puts the needs of constituents first. She has consulted on issues with residents over her 26 years of service. “There are lots of good things happening and it bothers me that all this negativity is there”. “York South-Weston is a good community and vibrant”. Dory Chalhoub thanked his supporters and said his candidacy gives voters an option. He feels the area is neglected and dilapidated and the person responsible over the past quarter century has been Councillor Nunziata. It is time for a change – the abysmal status quo cannot go on with crime, the business exodus and so on. Audience questions then explored further differences between the candidates. One obvious area is that of experience. This is Chalhoub’s first run at the job and naturally he’s vulnerable to the criticism that he’s not up to speed on local politics. The first question addressed to both candidates about the naming of and familiarity with resident groups seemed designed to trap the challenger and expose his novice status. While Nunziata was able to name them, Chalhoub confidently turned it around and said, “That’s her job and it’s expected of her”. Both candidates did agree on the need for subways rather than other forms of transportation – Nunziata would find money through development charges while Chalhoub would find efficiencies. Both are coy about their choice for mayor, would have liked to have seen a casino; both like privatization within limits and are opposed to tax increases. Another bone of contention between the two was the lighting art installation at Weston Road and Dennis Avenue. Chalhoub feels the money could have been spent more wisely while Nunziata defended the project. With regard to priorities, Chalhoub would like to see the area cleaned up and aesthetics improved. He would like to see incentives for businesses to open and create jobs; access grants and put the money back into the community. In response to criticism of him being negative, his answer was, “Step outside and see what’s going on. I don’t see this ‘vibrant community'”. In closing, Chalhoub stated that his decision to run is personal rather than political. He will work hard to provide better direction and leadership. He said that if insanity is doing the same thing over and over and expecting the results to be different, that’s similar to people who think somehow the next four years are going to be better with more of the same. Nunziata ended by saying that she represents all of Ward 11. In the past 26 years and in particular the last four, she has spearheaded projects such as the York Recreation Centre, obtained $1.5 million from Metrolinx to go towards a cultural Hub on the site of the Farmers Market and is working to change the proposed use of the Kodak Lands from a rail yard to a more mixed use. She has established an off-leash dog park in the Hydro corridor in the south of the Ward and is working towards another on King Street. She feels she has gained the respect of her constituents. While there is no love lost between these two candidates, their platforms are both quite similar and somewhat on the right of the political spectrum. Where they differ is in their perception of what is happening in Ward 11 and in particular the Weston / Mount Dennis / Rockcliffe Smythe communities. Ms Nunziata would have us believe that things aren’t so bad under her leadership and tomorrow will be better. Mr. Chalhoub thinks a lot more work needs to be done; it’s time for a change and he can do better. We’ll find out on October 27. Let’s hope for a good turnout. Author Roy MurrayPosted on October 16, 2014 Categories Muncipal Election, OpinionTags Dory Chalhoub, Frances Nunziata, Mount Dennis, Toronto Civic Election 2014, weston, York South Weston4 Comments on Nunziata: Weston is a good, vibrant community. YMCA at Weston and Lawrence? Democracy is still in its infancy here in Ward 11. Another election has rolled around and with only three candidates running for Toronto City Council, it looks likely that incumbent Councillor Frances Nunziata will be handily re-elected. During a recent all-candidates debate held at Rogers TV, only Dory Chalhoub and Ms. Nunziata showed up. Candidate Jose Garcia did not attend. The two candidates seem to share a right-wing viewpoint with the two of them expressing on the one hand a grim determination to keep taxes and tax increases to a bare minimum and on the other, bewilderment at the lack of infrastructure and transportation spending over the last forty years. On many occasions, Ms. Nunziata was able to handily swat down Mr. Chalhoub by exploiting his inexperience and absence at meetings of concern to the ward. With regard to their Mayoral preference, Nunziata is keeping her options open by cannily staying ‘neutral’ although she did allow that John Tory will be continuing the Ford agenda (unlike Doug presumably). John Tory is the choice of Dory Chalhoub. One quote that stuck out from the back and forth came from Ms. Nunziata, who while citing her achievements declared that, “…at Weston and Lawrence we will be getting a YMCA.” This is the second time WestonWeb has heard the councillor mention this and we note she did not mention the word ‘might’ but used ‘will’. Perhaps readers can ask Ms. Nunziata for more details at the next debate on October 15th at the Mount Dennis Legion. Ageless moderator Gord Martineau had an easy time keeping order throughout. The debate can be viewed here but Rogers seems to be restricting access to subscribers (login required). Author Roy MurrayPosted on October 10, 2014 Categories Muncipal Election, OpinionTags Dory Chalhoub, Frances Nunziata, Jose Garcia, Toronto City Council, York South Weston6 Comments on YMCA at Weston and Lawrence?